There is no cure for herpes simplex. However, people can be treated with an antiviral medicine. Antiviral drugs reduce the number of outbreaks by decreasing the viral shedding and lower the risk of infecting other persons. All antiherpes drugs prevent the herpes simplex virus (HSV) from synthesizing its DNA. Acyclovir is a guanosine analogue which is converted by viral thymidine kinase to aciclovir monophosphate, and then converted by host cell kinases to aciclovir triphosphate (ACV-TP). In turn, ACV-TP inhibits and inactivates herpes-encoded DNA polymerase preventing further viral DNA synthesis. Another guanosine analogue called penciclovir is approved and exhibits low toxicity and good selectivity. Other related compounds including valacyclovir and famciclovir are efficient acyclic nucleoside analogs. 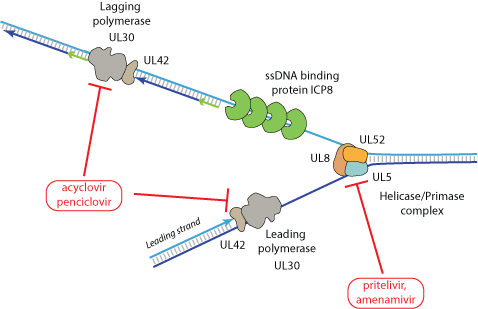 The HSV helicase/primase complex is a heterotrimer composed of UL5 (helicase), UL52 (primase), and UL8. This complex works together with the DNA polymerase during DNA strand replication, acting to unwind dsDNA at the replication fork and prime the leading and lagging strands prior to polymerase activity. Several compounds such as amenamevir or pritelivir have been developed that are able to inhibit the helicase/primase complex. Although they are not yet approved and still in phase II, these drugs seem very promising.